We all know the basics of healthy aging: milk builds strong bones and exercise supports a healthy heart. But what about the less obvious ways diet and exercise help keep your body young? Food does more than produce energy for you to function. Foods rich in antioxidants and omega-3s reduce the free-radical reactions in your body. In high concentrations, these reactions can harm the macula (the part of your eye responsible for central vision) and constrict your arteries’ blood flow (damaging the nerve tissue in your inner ears). By eating leafy greens and fish, foods high in antioxidants and omega-3s, you can help slow down the degradation of your eyesight and hearing. Flavonoids also play an important role in your health. Found in plant-derived foods and drinks like apples, citrus fruits and green tea, flavonoids are responsible for repairing damage in the brain. They boost the brain’s ability to form new neurons and prevent brain cells from dying. This can reverse many of the normal cognitive changes and memory problems that accompany aging. Working out has many hidden benefits for your body. Frequent aerobic exercise can increase your HDL, or good cholesterol. It has anti-inflammatory and anti-oxidative effects that fight off the causes of cataracts (the clouding of your eye lens). 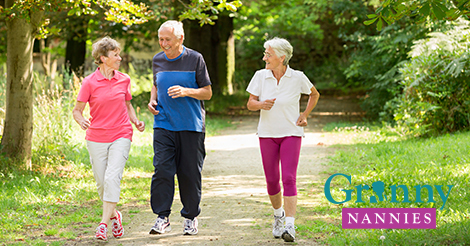 Spending 20-30 minutes five days a week walking can help build up the amount of HDL in your body, and will continue to prevent the blurry vision associated with cataracts. Walking also increases blood flow to the brain which can improve auditory attention and your ability to process sound. Much like there are specific exercises for your abs or arms, scientists have developed exercises that can benefit the brain. Cognitive training initiates structural changes in the brain, strengthening the existing synaptic connections and stimulating the growth of new ones. By adding the following activities into your routine, you can effectively decrease the rate in which they decay. Reading, learning to play a new instrument, studying another language, doing crossword puzzles and playing games of strategy can ward off this age-related cognitive decline. The Certified Nursing Assistants and Home Health Aides at Granny NANNIES are available 24 hours a day, seven days a week to help with meal preparation and mental and physical exercise. Founded in 1990, Granny NANNIES offers care services for individuals of any age or with any need. Our clients are consistently treated with the highest level of respect and dignity and are matched with the right private duty caregiver to provide care services in the home, hospital, assisted living facility or nursing home. For quality, trustworthy, reliable and affordable senior care, call 800-316-2669.